This 15-minute grilled honey garlic salmon is perfect for days when you crave a fancy meal but don’t want to pay for it or spend hours making it. It is so finger-licking good that you’ll imagine you are in an upscale restaurant enjoying a gourmet meal. This post is written by me on behalf of Frontier Co-op. This shop has been compensated by Mambo Sprouts and its advertiser. All opinions are mine alone. School starts this week and I don’t even want to think about it. It is because, for someone who likes to cook at leisure and savor every bite, the whole idea of rushed dinners bugs me. The only way out of this is to come up with recipes that are not only quick to make but are so flavorful that you forget the drudgery of running on a schedule. One such recipe that I came up with is the grilled honey garlic salmon. The sweetness of the honey, the tang from the lime juice when combined with garlic and crushed red chili pepper yields a tantalizing dish packed with flavor. One bite of this perfect, velvety piece of fish will make you believe that you are eating a gourmet meal in a fancy restaurant whilst sipping your favorite cocktail. Don’t believe me, make it and I will let you be the judge. How to make grilled honey garlic salmon? As far as the ingredients are concerned, we are obsessed with using only the best ingredients for our meal. After all, we are what we eat. That is why, we always make our food with high-quality organic, non-GMO ingredients such as the ones from Frontier co-op. 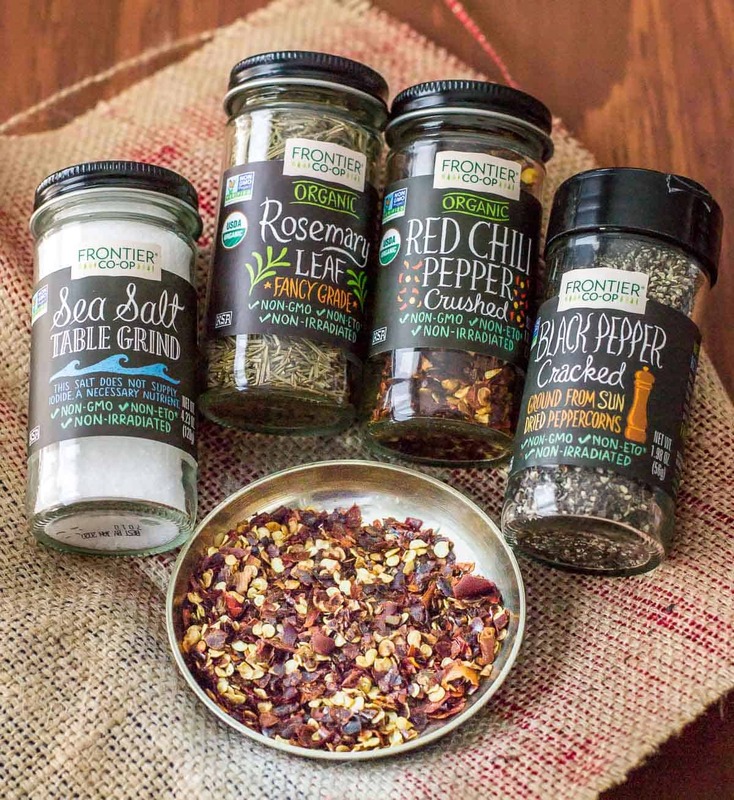 Frontier co-op sources their spices from growers committed to quality, sustainability, and ethical trade. They work hand-in-hand with the growers to provide the highest quality products to customers like us and is the first U.S. company to offer Fair Trade spices. 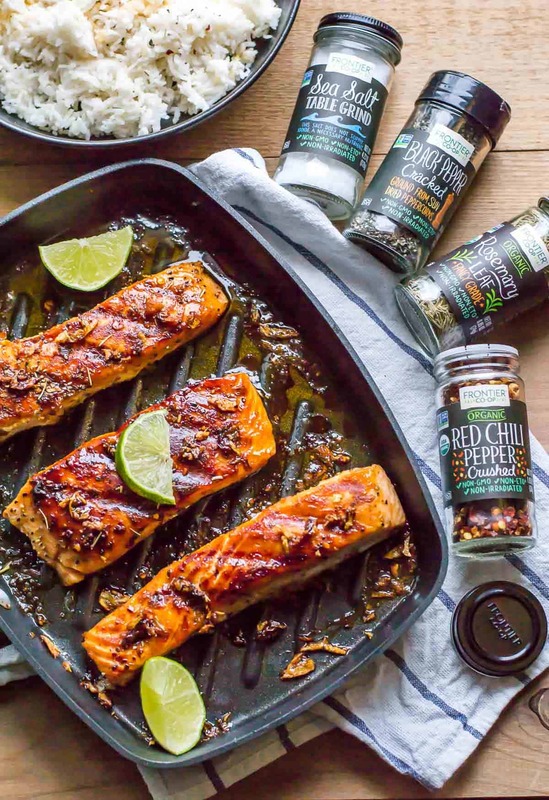 You’ll love their crushed red chili pepper flakes – it adds a peppery heat to this grilled salmon dish and livens it up. These flakes are also great in marinara sauce, as a pizza topping, in scrambled eggs, on grilled vegetables and meats. I loved the heat of this crushed red chili pepper flakes so much that I included this ingredient in my one-pot curry shrimp pasta (recipe coming up soon) as well. 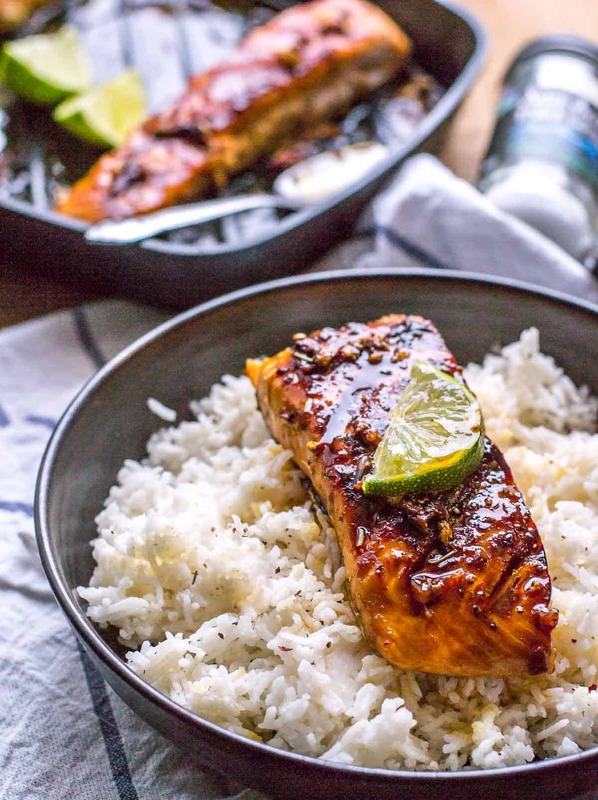 There are 3 ways you could make this grilled honey garlic salmon – using a grill pan (like I did), outdoor grill or baking it in an oven. Note – Baking time for the salmon depends on its thickness. As a rule of thumb, for every half inch of salmon, bake it for 5-6 minutes. This 15-minute grilled honey garlic salmon is perfect for days when you crave a fancy meal but don't want to pay for it or spend hours making it. It is so finger-licking good that you'll imagine you are in an upscale restaurant enjoying a gourmet meal. Thaw the salmon and pat it dry with a napkin and set it aside on a plate. Prepare the marinade using lime juice, minced garlic cloves, crushed red chili pepper, honey, salt, black pepper and dried rosemary leaves. Pour the marinade over the salmon and coat it completely with the marinade. In a grill pan, heat ghee or olive oil over medium heat. Place the salmon skin side down, pour the leftover marinade over it and cook for approximately 6 minutes over medium heat. Flip the salmon gently and place the lid. Cook for another 6 minutes or until done. At this point, the marinade thickens and forms a caramelized coating on the salmon. Switch off the heat. Before serving, spoon up the sauce from the pan and slather it on the salmon. Add a dash of lemon juice and garnish with crushed red chili pepper and dried rosemary leaves. Line a baking sheet with foil. Place the marinated salmon on the baking sheet.Transfer it to the oven. Bake it for 13-15 minutes until the fish flakes easily with a fork (see note above). Broil it for a quick minute on low if you like the top of the salmon crisp. 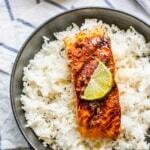 After trying this grilled honey garlic salmon, you will totally get why I am raving about it. As the salmon cooks, all the flavors from the marinade get infused into it. The taste of garlic and rosemary combined with pepper and honey build layers of flavor that make this grilled salmon dish taste like a million bucks. 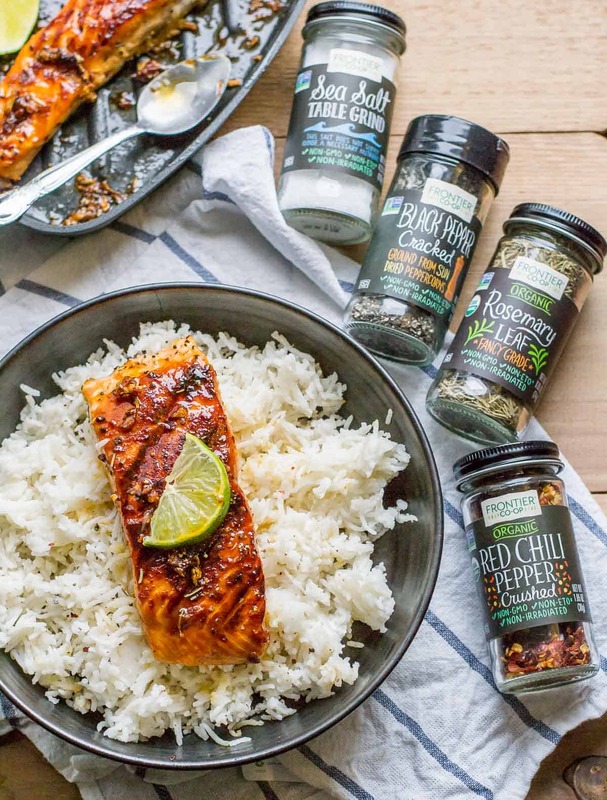 Now, go shopping and buy Frontier Co-op spices to make this delicious salmon dish and to #CookWithPurpose. Here’s yet another salmon recipe I am sure you would enjoy. I have been wanting to make a grill salmon…just started to get into fish. This will be the perfect recipe. Mary, thanks for stopping by. Would love to hear from you on how this dish turned out.